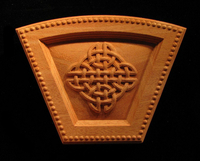 Heartwood Carving offers the following showcase of carved wood collections of similar themed wood carved design ideas for decorative trim. 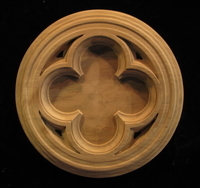 Each carved element can be combined with any other wood carved decor theme to allow you to tailor the combinations to suit your requirements for decorative Window and Door Trims, Mantel components, Cabinetry Accents or Decor and furnishings. The bullseye rosette is the most common rosette form. Its name drawn from its association with a "bullseye" target has been installed from colonial to contemporary times. Its an easy form with many many variants. Heartwood has been making them for years and most often they are generated from period pieces submitted to us for reproduction. If you can't find yours let us know and we can make one for you using our custom program. A collection featuring a variety of carved weaves and Celtic and Gaelic inspired trim decor products which intermingle and compliment. A growing collection of transitional , nouveau and contemporary carved offerings. Examples of carved Art Deco and Craftsman inspired mouldings, onlays & appliques, columns and other architectural details. 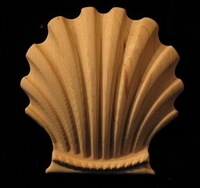 Carved Egg and Dart is one of the most classic forms still in wide use today. 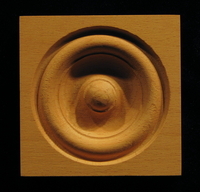 Most commonly found in carved moldings, Heartwood can tailor any of the art shown and combine to a standard profile or a custom one of your choosing. 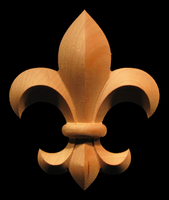 The Fleur de Lis form, french for "flower of the lily" is prominent in many french inspired carvings and coats of arms. The form has been stylized into many derivations and a few are offered here as onlays, blocks and scrollworks. Heartwood is always willing to entertain alternative derivations by request. Grapes and Vines carved collection of wood decor trim. A collection of carve wood oak leaf and acorn inspired decor and trim products. A collection of carved wood pineapple inspired decor and trim products. A collection of carved ropes, twists and spirals.